"In my Aunt's sideboard was a packet of around 30 letters, I was allowed to take a few out now and then, but was carefully watched by my Aunts to make sure they were replaced where I had found them. These letters were written by Joe, starting just before the outbreak of WW1, until his death in 1916. Again these are wonderful letters to his devoted mother, telling of his enlistment and life in the Royal Navy, his training, uniform, girl friends, sleeping in a hammock, and stories of life on the ship, until it came to when the letters became censored, then they were very short." "Joe's family were living at Osgodby, near Market Rasen at the time. The people Joe mentions will be his friends from the village or surrounding area." Just a few lines in answer to your ever welcome letter. Its is a very miserable week end, started raining yesterday evening, and is continuing at this present moment. I shall not learn French now, because I am desirous of joining the Royal Navy before the 30th day of November. I am going to work three more weeks, then come home for a weeks holiday before joining. I think it is my duty to go, because I am the right age, and also medically fit. But if you do not want me to go, I will give over thinking about it. I have had a letter from Lord Derby which I enclose. We are only 14 miles off the scene of the last air-raid at Guildford. They did more damage than what was publish in the papers. I had my photo taken last Saturday, but it is only a poor one. I was very pleased to receive those nice letters from Annie and Ted, and also the three photo's. We are getting on with our work nicely now. I let Harry have a look at the photo's, he said Ted had altered a lot, but Annie had not. Joe is obviously working away from home, my current Atlas doesn't give a place called Cove in Surrey. I have no idea how he came to working so far from Lincolnshire. Joe was the eldest of my grandparents seven children. He was born 5th February 1896 at Hainton, Lincolnshire. I have two photographs of him. I do have a postcard, which is in two pieces, showing a "Dunne" Aeroplane, on r/h side of card it says 'Mays, Aldershot' It has been sent in an envelope to Joe's sister Annie, sending all his love. I Googled "Dunne's Aeroplanes" and read some very interesting things about John Wm Dunne, he was the son of General Sir John Hart Dunn KCB 1835-1924. John Dunne Jnr was born 1875 in Ireland. John Dunne was a pioneer aeronautical engineer, designed military aircraft, concentrating on tailess designs. He designed many planes and biplanes. Joe must have bought the postcard whilst visiting the flying fields. I see in the information about John Dunne, he was at one time assigned to the Army Balloon Factory in Sth Farnborough (1905) I see Farnborough is only about 7 miles from Guildford. The postcard by the way shows a biplane, an extremely flimsy object of struts, wire and a bit of canvas, attached to what looks like two pram wheels. Lord Derby's letter isn't in the envelope. Our leave is according to our duty division. I am in the second division, so shall be a-shore tomorrow Sunday. My arm is very painful through vaccination. I expect I shall have to get four teeth out on Monday, but I am going to get out of it if possible. My bed is an hammock strung from two iron beams, they are alright to sleep in. I have been in the muster bag room since Tuesday learning to sling my hammock and also to pack my kit bag properly. My kit consists of as follows, - two blue suits - 3 white duck suits - spare white trousers - 2 under shirts - 2 pairs pants - 2 pairs socks. 1 jersey - 1 muffler - 2 Cholera Belts - 1 blue and 1 white hat - 2 lanyards and a knife - 5 brushes - 2 pairs boots and a ditty box and a hat box. On Wednesday it being the first day of the month tobacco and soap were issued. I got a pound of tobacco for 1/2d, 4 lbs of soap for 8d. They stop so much money per week for such things, then at 3 months end they give us the balance. I did not get any money from Robinson so Dad had better remember him about it. Expect to get six days leave at Exmas or New Year, will let you know which. Remember me to all enquiring friends. Well must close, am tired after a hard days work. Just a few lines in return for your your welcome letter. Pleased to hear you received my clothes alright. I have had four double teeth drawn, so I shall be nearly toothless now. Saturday I was ashore, so had a good look round the town, and also the port. Had a good view of the Victory. I expect to go on board a training ship on Saturday, named the Dia-dem. Our company will finish squad drill on Thursday. I shall be a real "slavey" soon, and shall be able to do all your washing when I come home. We go to Church every day in the theatre. Shall soon be a fire-man am in the fire-escape's crew. I have got a real bad cold, can hardly speak some times, and have got cold in my gums. Do not base your thoughts on my coming home for Exmas, because I expect there will be no Exmas leave granted. If not I shall not come till I have finished training. Glad to hear you are all well, and that Dad thinks a bit about me. Will let you .. if any-thing different happens next week. I have a very tattered postcard, date stamp is 30 November 1915 Portsmouth. Joseph was born on 5th Feb 1896, his birth was registered at Hainton Lincs Certificate No C80937. Joseph was baptised 15th March 1896 at Hainton, Entry No 510. His was father was William Lee Smith and his mother Mary Ann nee ROSSINGTON. He was their eldest child. The family used LEE SMITH as their surname, I have envelopes addressed to them in this way, there was no hyphen. William Lee SMITH's mother was Hannah LEE, and LEE has been used as a middle christian name in the family right up to the present day. William's brother Bernard Joseph SMITH went to Canada, and LEE has been used as a middle Christian name over there as well. This letter is written on notepaper headed with crossed Union Jacks. Many thanks for your kind letter and parcel. I came aboard the training ship on New Years 's Day. Cannot get ashore not while a week next Sunday. It is look out for your self here as regards food but I do not miss any. I sling my hammock in the mess deck, but several sleep on the upper deck. We are packed like herrings in a box, but you may bet I am in a good place. I have had a look round the armoured deck, and stoke hold to-day. Talk about having something to learn, "nor arf". I have a had head-ache ever since I landed at the barracks. I shall not do much work this week only looking around different parts of the ship. Glad to hear you had a merry Xxmas, and I hope Dad did not make a fool of himself. I wrote to H. Frow a week before Christmas but have not had a reply. Perhaps he is angry with met yet. I did not expect he would come to see F. F. any more, when I left. Will get my photo taken when I get ashore again. So when you get them you can send one to Aunts Sarah and Eliza. Tell Dad to remember me to Jar, and any-body who inquires after me. I have not received the New Year's gift you have been talking about from the proceeds of the concert. Well give my best love to all at home, hoping you are all well as I am right at present. Must Close with you all in my thoughts. p.s. Do not change the address when you write, excuse me for not replying sooner, but stamps are a scarce article here. Joe made reference regarding his father not making a fool of himself. Apparently my Grandfather rather liked a drink, tho according to work note books I found in the Grandfather Bag, he was only earning £2.0s.0d at this time. I received your letter on Saturday, I passed out of my mechanical training last Thursday, but did not get rated. Only six out of 22 in our class got rated to first class stokers. I got good but you had to get V good. I only made one little mistake. I passed out of swimming last Friday morning. I had to swim the length of the whole bath in a white duck suit. I swam it the first time but it didn'nt half pull when I got to the shallow end. Started rifle drill to-day. Went to the gym this afternoon. We had to climb rope ladders, and ropes, box, a relay race, and physical drill. Have not got my photo taken yet. I expect you do not hear any thing about H Frow now-a-days. J Robinson may think herself lucky, he has given out paying his attentions to her. She would do, if she knew as much as I do. I am quite happy here now I have got into the run of the thing, and know how to work points. I think I shall go to India or some far-away place like that for three years when I have finished my training. I hope so. Well you must excuse my short letter, because I cannot think of much to write about. Just a few lines to let you know I received your letter. It is a nice day here for once, the .... is sharp like a frost. There was a fire in the dockyard this morning. The men of the first and third divisions had to go, when the duty divisional call sounded. A cook's mate got tired of living, so he hung himself in the lavatory one night last week. A young fellow who passed the doctor the same day as I, and travelled here with me, was on the H.M.S. King Edward VIII he had only just got aboard when she struck a mine. Ten men were swept away by the sea, all the rest were saved. He is back again in barracks. There seems to be several patriotic people around home yet. Sorry to hear you have got a bad cold. Mine is a lot better bar my throat is sore. I got a box of Peps, they did my cold good. I have not managed to swim very well yet. but hope to do so soon. We had a pork, potatoes, cabbage and custard and figs. All my pals tell me that I am getting fat all the better (something doing). Hope Dad is keeping straight, and tell him to remember me to J Harrison. Well, I cannot think of anything else to write. p.s. Have not got my photo yet. Tell Baby, Joe is (Some Sailor) now. Just a few lines to let you know I am still alive and kicking. I should have wrote last week, but I was waiting for a letter every day. Am getting on alright at rifle drill, this is my third week. We get plenty of gyms now. Have been mustering my hammock, and washing this afternoon. The air-raid it seems was not very far away, I only read a few details about it. I bet Sharp would nap his eye when he was at the police court. I had a post-card from Aunt Sarah, shall write her, when I am in a writing mood. I had a nice look round all along the fore shore last Sunday at Southsea, It is well fortified with big guns. It will be no use keeping my Sunday suit for me, so you can do what you like with it. Just a few lines hoping you are all in a better state of health now. I have been waiting till I had finished rifle drill/Wednesday before writing you. When I went firing on the range I made 64 points off my right shoulder. The first time I have shot off my right shoulder. I think I were alright when passing out I know every little part of a rifle. Our class has got a week's working party, the other classes which passed out have got drafting chits. They are going to the Eastern Meditteranian. I have shifted to the men's side now, and get a job till ten every other night. I dont know whether I shall get leave next week but shall let you know. If I come home shall bring Dad half-a-pound of real sailor's plug, and Mother the coat-of-arms. I should advise you to see to Annie's throat if it will do her good. Have not received a letter from Aunt Agnes, and I don't know what address she would write to. Tell Jarv to be at home a week on Saturday, so that I should see him, if I do come home. Well I cannot grumble about the Navy so far, I get more (scran) than ever. Started drawing my rum yesterday, and also received my monthly issue of tobacco and soap. Do your require a washer woman. Have not gone ashore tonight. Aunt Agnes, is Joe's fathers sister. She went to Canada as a Companion to an English Woman. She lived in Toronto. One sheet of notepaper with Y.M.C.A. with His Majesty's Fleet heading. Just a few lines hoping you are all well. I got to Portsmouth alright on Wednesday night at quarter to nine. I stopped all night at the Sailors Rest, after I had been at the Hippodrome. When I got in Barracks this morning we all had to report ourselves to the drafting corporal. My place of abode for a few days is at Haslar Camp. There is plenty of water and mud up to the boot tops, and we have to sleep in tents. Shall send you my photo next time I write. I rode from Lincoln to King's Cross with a nice young lady, who had been living at Cannick Hall. We started talking, and I think we both fell in love. She has invited me to spend part of my next leave at her home in Suffolk. I expect we are waiting here for a ship, but I don't want to stay here long because it is a bit too rough. I think we get extra money for sleeping rough in tents, they lend us two blankets. Shall get a bit of digging here, digging gravel for the roads. Several of my mates were adrift this morning. Well I hope you will not fret about me too much, because God will look after me in my perils. I hope Dad will not go drinking so much, and look after you all better for my sake. I received your letter alright. We are having a lot of rain every day so far. It is grand digging gravel all day in the wet, when we are not dodging in our tent. Got our last weeks pay to-day for a good job. If it was fine weather I would not mind staying here. Sorry I did not know Miss Overton was going down to London. Hope you are having better weather at home, or things will not run very smoothly. Baby will be able to see me in bagging trousers, for I am sending you my photo. Tell Dolly to send me the socks as soon as possible, because I might go away any day. Has Dad smoked all his tobacco yet. The young lady's name is Miss Elsie Rowe, and her home is in Suffolk. Well, remember me to all inquiring friends, especially girl friends. Excuse short letter, because I have been busy writing lately, so will close. Dolly is one of Joe's sisters. Just a few lines in answer to your letter. It is alright here now we are having some fine weather. Last night was very windy, and I knew about it too. Then it started to rain, and the wind was blowing so hard that our tent pole broke. This was about mid-night, and we found ourselves wet and nearly smothered. It wer'ent' arf cold removing to spare tent in our night attire in the dark. So I have a little bit of experience about tent life now. We have had the pleasure this evening of hearing Canon Hicks from Lincoln give a lecture about consumption, and its causes (chiefly immorality). He gave us some straight tips about women. I am delighted to have the pleasure to hear so well known person, especially one from my own county. I am sure Mr Siddall will be pleased to hear the news. Hope Dad will keep straight for all our sakes, and not enlist, because I think I am sacrificing plenty without any one else. I am trying to do what he told me before I am joined, and what I have heard to-night about fast women is the same subject. Pleased Dad enjoyed the tobacco and appreciates it. Sending you three silk pictures in this letter. Well I will draw to a close hoping I shall not offend any-one, hoping you are all well as it leaves me at present. Mr Siddall was The Revd; Siddall, Vicar of Osgodby Church. I have a small piece of Blue paper, with Red printing, which reads as follows. It is to be distinctly understood that this promise has no reference to the use of wine in the Holy Communion, nor yet to the use of intoxicating liquers under medical orders. N.B. This pledge does not in itself admit to membership. This piece of paper, was also found in the woodshed slipped inside a book. I know from things my maiden aunt's said, that William was still drinking after they moved from Osgodby to Holton le Clay, Lincs. Just a few lines hoping you are all well as it leaves me at present. We are having some fine weather here now. I was aboard the Queens YachT ("Alexandrea") coaling her on Monday. I was out in the rough weather on Tuesday evening in a steam boat, wet through, and the boat very nearly swamped. It was a little bit too real to be pleasant. I was very pleased to receive the socks and the cakes which rather surprised me. Had to pass the doctor this afternoon for draft, on Monday morning. I expect going on the (H.M.S. Nubian) for foreign service, but am not sure yet. Been working most of the week on the torpedo destroyer Falcan. I shall not be able to send Dad any tobacco now, but hope to bring some when I come home on leave again if lucky. Am sending Dolly a brooch, and hope she will like it. Shall send her a photo when I write again. Your Loving Brother and Son. I received your letter this afternoon safely. It is alright being on the sea in this weather. It was a funny sensation down below the first time, running at full speed. I can just about manage a stokehold now. We do not stop long in a place, and never know when we are going out. I have never seen that young man from Osgodby yet. I am getting quite an expert with a needle now. Well I thank you for the postal order, and will send one in return as soon as possible. Hoping you are all well as it leaves me at present. Just a few lines in answer to yours. It is no good sending me those, because they will be of no use, so please send me the money instead. I can buy the right sort then. Cannot put any news, all letters have to pass the censor. Just a few lines to let you know I am safe and well. We are having some nice weather on the pond now. I want you to send me one of my French Dictionary's and some stamps as well. Stamps are bad to get, as we do not get ashore much, that is why I have not wrote lately. Let me know all the latest news about all the boys from home. I expect Dad will have nearly finished threshing by now. Send me Aunt Agnes's address as I want to write her. Am enclosing £3.18s in this letter for you to save for me when I come home on leave. Well I cannot write any news so will draw to a close. I have two long black ribbons from Joe's uniform hats. each is about one yard long, and the names of the ships embroidered in Gold Thread, which is quite tarnished now, H.M.S. Victory and H.M.S. Nubian. Just a few lines in answer to your letter which I received this morning. We have been out on our trial trip this morning and are going to Portland. You had better send the money, because I shall very likely get put in the rattle, if I am seen with toe capped boots ashore. Both my pair of boots are hardly fit to put on now. Well I am well satisfied with my boat. I did my first watch this fore noon from Eight till 12. I was looking after one boiler with ten burners (oil fuel). Please send letters as soon as possible. Shall have between £3 and £4 to draw the first of next month so will send you the cash as soon as possible. I am typing these as Joe wrote them. 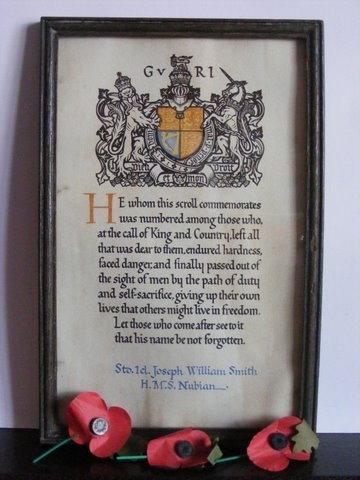 Joe volunteered for the Royal Navy 26 November 1915, for a period of 5 or 7 years, Special Service, and has worn out the two pairs of boots that were issued to him. I have the original document which was filled out when Joe enlisted, it is written on a waxy sort of waterproof paper. His place of birth is given as Hainton, Market Raven, Lancashire. Somebody needed georgaphy lessons, those of you that live in Lincolnshire will know it should read 'Hainton, Market Rasen, Lincolnshire'. This letter has no month in the date, but must be in May. It is simple great being on the water this weather. We get ashore about every two or three weeks for 2 or 3 times when we stand off. I do not care much for Dover, there is nothing much to interest any - body. It was good of you to send me those stamps and I am pleased to hear you got the money alright. I expect every-thing lovely round-about home now. The country will be strange to me when I come home again. Am corresponding with E Jarvis again, had a nice letter from her this week. Had my first taste of action this week, and we very nearly got hit, a shell dropping within ten feet away from us. You seem rather busy in the marriage line just lately. Tell Dad I hope he is keeping steady, and looking after you-all well for my sake. I am living in hopes of seeing you all again about August. My P.O. gives me a good word, and says that I am quick at picking things up. Shall very likely try to get rated at the begining of next month. Just a few lines in answer to your welcome letter. I am pleased to hear every - thing is going alright at home. We are having fairly good time at present, only a few Taube's to bother us. C. Rands seems to be having some bad luck lately, will you tell his parents that I wish to be remember to him. The old portable engine in the mill will soon want repairing with a new one. I bet Sharp wont "arf nap his eyes" now he has started in a-nother line of business. Sorry to hear Father Smith has passed away. He will be sadly missed by every - body. I think you are coming a little bit too thick now, talking about bringing the "little bit of fluff" home so soon. Hoping you are in good health. Just a few lines in answer to your letter which I received on the 9th. I write you once every week, so you should receive them more regular. We were not in the battle, so dont worry yourself too much. It is alright sailing now, nice and pleasant. When we are at anchor, we amuse ourselves by fishing in our spare time. Fish are plentiful, and they bite well too. We have plenty of music on our mess deck, namely two manodlines and one concertina. I am thinking of buying a violin, when I go ashore again. You would not think there was a war on, if you heard us at night. Well I cannot write any news, only acknowledge your letters. So will close. Just a few lines in answer to your welcome letter. Excuse the delay in answering we have been standing off for three days. I was so eager to get ashore, that I never gave my mind to writing. Well I am pleased to hear that you are all well at home. I have not received any letters from Jarv yet, so send me his address. You did well at the garden party to get the amount of money you mention. Ben will swank now he has got promoted. We are getting quite industrious on our mess deck lately..
What does J. Neave think of the Navy, does he like it alright. I had an invitation to spend a day at Milmirly when I heard from there last. Well I am safe, and sound, bar having a lot of trouble with my throat lately. So if you get me something, please send it along. Just a few lines in answer to your letter which I received on Sunday 23rd. We are having quite an easy time of it now. One day we sunk a mine last week while on patrol. Took General R - over to B - again. There seems to have been plenty of sport just lately round-about you. I wish I have been there to see some of the fun. Our Navy is rapidly getting larger, we are building at least one ship a week, so I think we shall smash their Fleet up alright. Am going to get a fancy table cloth to work in with silk, and shall make Edith a present of it. We are getting quite affectionate now, she is always worrying about me and my work. She thinks I shall ruin my health, and wants me to get a different job. I must be quite a delicate and weak person now. There is a buzz about leave in August. I hope we do not get leave yet, because I have not saved any more money yet. It seems to go before I have time to think about it. Last stand off I had the misfortune to lose a 10s note the first day ashore. Edith is quite busy now working among the hay, besides doing the posting. So I think she is doing her bit in this war. I am sorry to hear you are not very well and hope you will soon be alright again. I hope Dad is keeping steady now, I wonder at him stopping with Robinson now, when so many good jobs are vacant. Shall post this when I can get ashore. Well I must close now hoping your all well as it leaves me at present. Just a few lines in answer to yours which I received this morning. Thanks for the stamps, they will be very useful. We are having quite a lot of foggy weather now, and it does not suit our job very well. Yesterday we had the good luck to sink a mine. I am getting on pretty well with swimming now, we can go over the side nearly every night if we like. Got paid today, and shall send some money as soon as I get a registered letter. I am studying oil fuel strong now. I expect you will be getting some more letters returned now, because several have been lost. If you should find that little dictionery of mine any time, please send it, as the other is not much good. Shall remember you to Edith when I write her again. Glad to hear you are all well as it leaves me at present. Just a few lines in answer to your welcome letter which I received safely this afternoon. Many thanks for the book, it is very kind of Ted to send it. I am rather busy studying for a mechanical exam now. I expect to go before the Engineer on Monday or Tuesday to try to get rated. We started our standoff today till Tuesday morning. Shall post this in Dover tomorrow. While patrolling one day this week we had the good luck to sink two enemy mines by maxim fire. I happened to get hold of an old Chronicle and saw the Glentham Vacancy.. I was thinking Dolly would try for it. We are having a rather warm and uncomfortable time now in the stoke hold. I have not bought the cloth yet for Edith, so Dolly will have to wait a long time. Am enclosing 20s for you to take care of for me. I don't think Dad need be afraid of being called up yet. If I get rated I shall get a rise of three shillings a week. Some of our boats have had a scrap just lately. Edith sent me her photo last time she wrote, and is getting it taken again, and will forward me another. My word, though, our army has been strafing the Germans just lately. I could hear the big guns roaring when we anchored in Dunkirk one day. Old Casement has swung at last for a blessing. Well I must close now, hoping to see you soon. Dolly, Joe's sister, did try for the post of school teacher at Glentham and got the post. I have yet another piece of paper, torn out of a notebook, written by my grandmother. Miss D Smith, Kirkby -c-Osgodby, Lincoln. Less, Geographical Story, 63 over 80, written as a fraction. Pleased to hear that you received my money safely. We have been very busy lately repairing, have had a lot of trouble with our condensers. I went before the Engineer this evening, and passed alright. Several men have been rated on board our ship lately. I doubt Aunt Sarah will not fare very well now Uncle has been called up. Yes, I got the book alright, but I have not much time to study it. T. Phillipson would cough, and swear when Jack left him. I expect Dad has nearly finished threshing by now, While harvest begins again. Well, I have not much news, so will draw to a close. Hoping you are all enjoying the best of health the same as I am at present. The 16th day of May 1916 in action with German Destroyers off Zubrugge. Just a few lines in answer to your welcome letter. I had very nearly given up hopes of getting a letter. I might be home on Tuesday night by the 9 o'clock train, if I can get a good connection, if not shall arrive Wednesday morning. I have not the least idea how long we shall be here but hope we shall be here tidy while. Have got a nice new suit this week to come home in. Am expecting a letter any day from Edith, because I have not had a letter from her lately. Please excuse short letter and paper. Just a few lines to let you know that I have arrived safely. I was pretty fortunate in catching my connections. Our other watch has gone on seven days leave again today. Shall have an easy time now till we go back, because all the worst work is done. Well I have not much news, so please excuse pencil. Just a few lines in answer to your welcome letter. I expect we shall be leaving here next Thursday or Friday for Dover. We are going to have a different routine this time. 48 hours out and 24 hrs in, and a stand-off every twenty days. I have been getting stores in this week, and have been in charge of 4 men from the barracks. Have not done any hard work since we came here. I drew 21s when I returned from leave but it did not last long. It is very miserable here with no money I am fed up with it. I shall be glad when we get back to sea again. Well I have not got much news to send you. So will draw to a close. Hoping you are all well as it leaves me at present. I have not been able to write sooner as I have only just managed to get a registered envelope today. I am sending you £1 in this letter, and if you want more let me know. Fancy all my mates coming home just after I had left. We are at sea once again for good job. Has Dad accepted Mr Robert's offer yet, or does he intend to stop at the saw mill. You had the Zeppa a little bit too near to be pleasant. Well I have not got any particular news to say, so will draw to a close, hoping you are all well as it leaves me at present. The Zeppa or Zeppelin Joe is referring to, might have been the one that came over Cleethorpes, Lincs, The German Commander of the Zeppelin discharged some bombs whilst flying over Cleethorpes, which were a direct hit on the Baptist Chapel, it just so happened that a Detachment of Soldiers from the Manchester Regt; were billeted in the Chapel for the night, most of them were killed. I do have a report of this somewhere. I have been to the fine monument to these men, in Cleethorpes Cemetery, and made a list of all their names. Just a few lines in answer to your welcome letter. Pleased to hear that you received the registered letter safely. Fancy any-body telling you such yarns about me being wounded seriously. You had better let me know who the person is. I hope Annie will get on alright at the hospital. It is not a very serious case to operate on. Dad will be wise if he stops at the saw mill, instead of taking Robert's offer this winter. Dolly will be pleased the rosary that Percy gave her. We are getting a football team together on the ship for this season. Last Friday night we had the misfortune to lose our engineer, as he was washed over-board when we shipped a heavy sea. I have a few cigarettes occasionally from a young lady in Northumberland. J. Sharpe will nap his eyes now he is grand-pa. Tell Dad not to be long before he sends the fags, as I can always do with a smoke. Will Close now, hoping you are all well. In envelope with no stamp, Postmark Dover. Just a few lines in answer to yours which I received tonight. We finish our stand-off tomorrow morning. Pleased to hear the operation was successful. Have started keeping company with a nice young lady here. Have been introduced to the family as her fiance. Been to tea, supper for three nights. Our Engineer washed ashore today, both feet and one arm cut off. Remember me to all kind friends especially any young ladies, tell them to write. I think I shall make a match with this one. This will be posted ashore so please excuse scribble, as I am in a hurry, and cannot get ashore. Just a few lines in answer to yours, which I received this afternoon. Thanks for the cigarettes which will be a change from ticklers. We are at sea night and day now so I have not much time to write in. I want you to send me 10 shillings this weekend, as I want all I can possibly get. Sorry to trouble you, but will make it alright soon. Shall be sending you a silver brook with our ship's crest on, next week if we get them soon enough. We keep getting rather rough weather sometimes now, but I still weather the storm alright yet. The above was the last letter Joe wrote. He was drowned the following day. His body was washed ashore at St Margaret's Bay, at Cliffe in Kent. The Navy wanted to bury him in Kent, but my Grandmother wanted his body brought back to Osgodby. His coffin was sent by train. 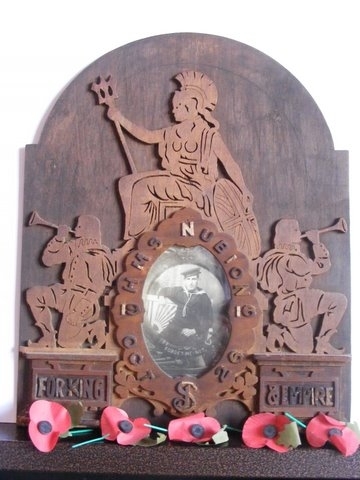 They couldn't get a detachment of Sailors for the funeral so Soldiers were sent from Lincoln Barracks to give military honours to the deceased. Service taken by the Revd; S. Siddell. Joe has a white War Graves Commission Headstone, in Osgodby Church yard, which is maintained by a volunteer. No great love has no man than to lay down his life for his friends. I understand it thundered and lightened during the funeral ceremony. 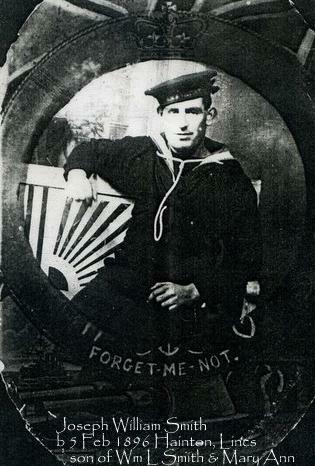 I only have one photograph of Joe, taken in his Naval Uniform. Joe's ship, the Tribal class destroyer H.M.S. Nubian, was torpedoed on 27 October, 1916, off Folkestone and her bow blown off. The ship was run ashore on the South Foreland to prevent its total loss. H.M.S. Zulu, a sister ship, had her stern blown off by a mine in November, 1916, and both ships were towed to Chatham dockyard. The two ships were "spliced" together to create a new warship renamed as H.M.S. Zubian. The Zubian served out the rest of the war and was broken up in 1919. Written by William Lee SMITH b 5 September 1873, Woodside, West Rasen, Lincs, son of Thomas SMITH and Hannah nee LEE. This letter is written by William to his sister Agnes SMITH in Toronto, Canada. Many thanks for your very kind letter of sympathy. We was very pleased to hear from you. The loss of our Dear Son, as been a terrible blow to us, he had got to be such a fine young fellow, and he was very good to us. It seemed only a few days after he had been home full of good health and spirits. Telling us how they had a few scraps with the enemy, and what they was going to do, as soon as they got ready and how well he was getting on, he had been promoted once. Then to come the sad news, that he was missing, then we got a wire to say that is body had been recovered, it did seem to make it a bit better being able to get him home for Burial. We do know where is poor body is, and we do hope and pray his Soul is where there is no war. We sent you a card and paper, which you will have got before now. So you will see that he had a Grand Funeral. I think all the people from around about were there, every body was very good to us, he was such a favourit. They was willing to do anything, you see there was not much time after we got to know they would send him home. We had to bury him as soon as we could as he had been dead about a week and then shaking all the way from Dover by train. We did not see him, I did say I would but the Coffin was labeled not to be opened. He had no doubt been knocking about in the water two or three days so we thought we would not open it. It was a very big one but he was a big lad. It did seem hard not to see him but we all has as much as we could bear it was some consolation to get him home there is many a poor lad buried and there parents know not how nor where. Wont it be a blessing when this terrible war is over. I expect we shall all have to go before it is over. We are going to have a meatless day a week now things will soon be serious over here. I wish I had stopped in Canada and got them all over there. How is poor Joe getting on we never hear any thing remember me to him. I will write to as soon as I can, we have sent him a card. You dont know how pleased I was to hear from you, this trouble as been the turning point in my life. I have signed the Pledge and I am trying by Gods help to lead a new life as soon as we can get turned round a bit I will send you some money. I am going to try and save all I can because if the Lord spares us all we shall come over to Canada again. I like it better than this Country, yet people in the towns are getting a lot of money now but everything is so dear. I am afraid when the war is over there will be a slump. I am working in a Saw Mill at Usselby now, we have cut nearly all the wood down on the Caistor Road. My hand hurt me a good bit this cold weather. I cant do anything, can Joe work now. 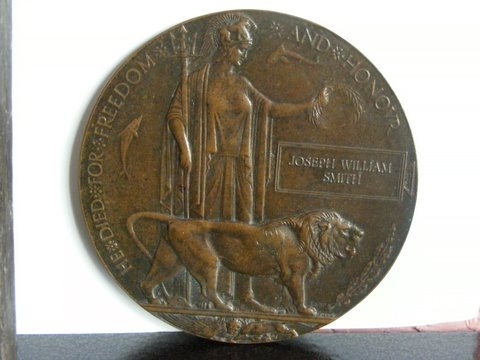 You must thank Mrs Whiteley for her kind sympathy, there is one consolation he died doing his Duty and he was not a conscript. We have only one of his photo's in Sailors clothes but we are going to get some took then. I will send you one, we have not got anything belonging to him yet but we are expecting hearing from the Admiralty every day. Well Dear Sister. I must now close - hoping you are in good health as it leaves us as well as can be expected, hoping to hear from you again soon. PS Poor Uncle Joe as had a stroke and as been in bed since August. My grandmother has written this across the top of the letter. Mrs Whiteley was English, Agnes worked for her as a Domestic Servant, when Mrs Whiteley's husband died, with his money she took Agnes with her to Canada, as her Companion. By the way, William did get called up, I have a Driving Licence Card for William dated 11 November 1918, at Spekeland, Liverpool, he is in a Motor Transport Division. The Joe that William mentions, is his brother, Bernard Joseph SMITH, the two men went over to Canada, encouraged by their sister Agnes. Bernard/Joe stayed in Canada, he sent for his wife and six children, they had a further six children in Canada. William only stayed a few months and then returned to his wife and family in England. William injured two fingers in a circular saw accident in the wood. I have the legal document, where he claimed, and was awarded a few pounds compensation.